Complete the story with the past simple form of the verbs. One day the hare and the tortoise decided to have a race. The hare (know) that he (can) run faster than the tortoise. 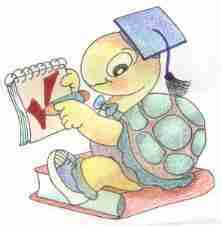 But the tortoise (be) more intelligent than the hare. 'Yes, I'll race you,' (say) the clever tortoise. The tortoise (have) a clever plan. He (find) his brothers and sisters and he (tell) them to wait in different places along the path of the race. So they all (hide) behind the trees along the path. The race (begin)! The tortoise (run) as fast as possible. But the hare (be) faster, of course. 'This will be a very easy race', (think) the hare. So the hare (decide) to have a rest, and he quickly (fall) asleep at the side of the road. Suddenly, the hare (wake up) and he (see) a tortoise ahead of him! 'How did he get ahead of me?' the hare asked himself. In fact, it (be) not his friend the tortoise: it (be) the tortoise's sister. But to a hare, all tortoises look the same. The hare (run) past the tortoise easily. Soon, he (can't) see the tortoise, so he (sit) down and he (have) another rest. Then the hare (get up) and continued the race. But - as the hare happily (come) around the last corner before the finish line - his friend the tortoise crossed the line and (win) the race!